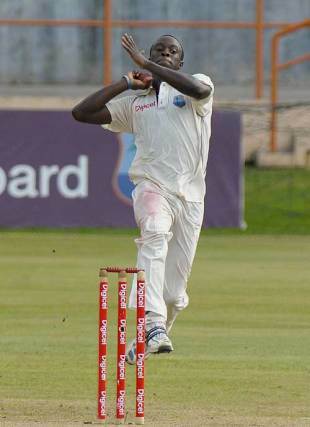 A fiery Kemar Roach grabbed a six-wicket haul to bowl out Bangladesh for 232 before the West Indies batsmen extended the lead to 61, with nine wickets intact, by close of play in Grenada. The lead could have been substantially more as Bangladesh were wobbling at 106 for 5, and then 157 for 7, but they rallied through vital contributions from Raqibul Hasan and Mushfiqur Rahim to leave the game interestingly poised. The Bangladesh batsmen turned in a below-par performance in the morning to lose four wickets cheaply and Roach led with a sterling display in the final two sessions to charge West Indies to a good position. Tino Best, who bowled well without much luck, supported Roach as West Indies applied the squeeze on the visitors. On a slow track, Roach bowled aggressively to pose problems for the batsmen. In the second over after lunch, Roach, who had oscillated between full and short of a length to Raqibul, bowled a lifting delivery that was awkwardly fended away. Sensing a weakness, Roach fired in a few more bouncers and one hit Raqibul on the elbow, forcing attention from the physio. The next ball, predictably, was another bouncer which Raqibul skillfully evaded by swaying away. However, the follow-up delivery was the trick ball - full and outside off and Raqibul, stuck at the crease, stabbed it to the keeper. That wicket seemed to have had an effect on Shakib Al Hasan who started playing wild shots. Soon enough, he pulled a short one from Roach to midwicket and Bangladesh slid to 157 for 7. Post tea, Roach turned the heat on against Mushfiqur, who had counter-attacked his way to lead Bangladesh's revival after the fall of Shakib. Mushfiqur had only faced six deliveries - that didn't include any bouncers - from Roach in the second session and lasted only three Roach deliveries in the last. The first two flew past his nose and the third, a full delivery, induced a fatal drive to the keeper. Roach then harassed Shahadat Hossain with lifting deliveries before he nailed him with another bouncer. He added a sixth wicket with yet another short delivery that Mahmudullah pulled straight to fine leg. It was not completely West Indies' day, though. Raqibul and Mushfiqur showed enough gumption to reduce the deficit before they were done in by the bumper strategy from Roach. Raqibul had walked in at 75 for 3, and before he could settle down the situation worsened to 106 for 5. Unlike in the first Test, Raqibul today played as close to the body to lead Bangladesh's revival. Mushfiqur too turned in a plucky performance to prevent West Indies from taking a big lead. In the second session, he played out Best with caution and took to the bowling of Darren Sammy and Ryan Hinds. He unfurled a cover drive and a slash to the point boundary off Sammy before reeling off a couple of square-driven fours against Hinds. The shot of his stay, though, was an imperious slog-sweep for six off Ryan Austin. Mushfiqur's judicious shot selection was in contrast to some of his team-mates' performances in the morning. The bowling at the start of the day wasn't threatening enough to take four wickets but the batting wasn't disciplined either. West Indies didn't bowl a cluster of pressure-building deliveries and Bangladesh prospered initially. Tamim Iqbal waited for full deliveries to drive and showed enough patience while defending or leaving the length balls outside off stump. It was a waiting game which he seemed to be winning before David Bernard produced a prod to a delivery that angled away. But with his exit, Bangladesh grew less disciplined to spoil the decent start. Their sloppy performance was best captured by Mohammad Ashraful's dismissal. He had struggled in the first Test but here started well. He did not attempt extravagant shots and seemed to be playing each ball on its merit. He had hit a fine square drive and an on-driven boundary before the customary lapse. It was a short and wide delivery from Hinds, the left-arm spinner, and Ashraful cut it tamely to point. It was similar to how Bernard had fallen in West Indies' innings. Both teams' batsmen seemed to be outdoing each other in their lack of commitment. Through this game, the bowlers from both teams have fought hard to seize the initiative but the batsmen have squandered the advantage. Bangladesh would hope their bowlers can produce yet another special effort tomorrow to keep them in the game.